Since eliminating terrorism the Sri Lankan Government has been ushering an era of development. The security forces hve extended its fullest cooperation in the development efforts and ensuring safety in the country. 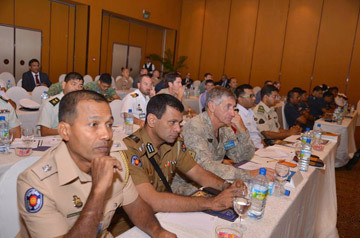 Global security experts, military and civil had met on several occasions in Sri Lanka under various themes, to review the strength of the security and cooperation among the nations. The aim of these meetings was to avoid the possibility of resurgence of terrorism and its adverse impact on security in various countries. With the prevailing peaceful environment in Sri Lanka and the conducive environment for such discussions more meetings are expected to take place shortly. In this backdrop the South and South East Asian Nations (SASEAN) Defence Chiefs’ Dialogue, which is a pioneering initiative will take place in Sri Lanka for the first time. “A ommon forum for the Defence Chiefs of Asia can bring about a robust mechanism to face future security challenges in Asia while ensuing Asian renaissance. That in view South and South East Asian Nations (SASEAN) Defence Chiefs’ Dialogue as a preliminary step is apt,” said General Jagath Jayasuriya, Chief of Defence Staff, who is the key man behind organising this international event. “It is an endeavour, which will encourage countries to find solutions for common issues. It will be a platform that can support mechanisms for countries to peacefully resolve their disputesbuilding a constructive dialogue avoiding instability or distrust, General Jayasuriya said speaking on the importance of this gathering of security chiefs in the region. The SASEAN Defence Chiefs’ Dialogue organised by the Office of the Chief of Defence Staff in collaboration with the Ministry of Defence and Urban Development is a catalyst in promoting security and stability meeting the challenges of the rapidly transforming Asian region. Philippines, Singapore, Thailand, Vietnam will be participating in the event, according to the Office of the Chief of Defence Staff. Accordingly the Conference on Interaction and Confidence Building Measures in Asia (CICA) mooted in 1992 could be recognised as the precursor to SASEAN. So far, it had been the largest membership among regional organisations in Asia engaged in promoting security and stability. It provided and continues to serve as a multinational forum for enhancing cooperation towards promoting peace and stability in Asia and brings together the political leadership in the region. The member states of CICA,while affirming their commitment to the UN Charter believe that peace and security in Asia can be achieved through dialogue and cooperation leading to a common indivisible area of security in Asia where all states co-exists peacefully and their peoples live in peace, freedom and prosperity. In such a backdrop, the concept of SASEAN was first conceived after observing the timely need for forming relations among the countries in the SAARC and ASEAN regions that are connected by common interests. As such under the guidance of Gotabaya Rajapaksa, Secretary to the Ministry of Defence and Urban Development, the first Defence Chiefs’ Dialogue in the SASEAN region. Divided into several sessions over three days, the invited Chiefs of Defence Staff will focus on matters of common interest and other related subjects. The Defence Secretary Gotabaya Rajapaksa will be the keynote speaker while a special session will be conducted by Prof G L Peiris, Minister of External Affairs on the significance of the forum.